I lost a chapter today. It disappeared into the ether. Perhaps I saved another chapter over it. Perhaps I called it a name that I promptly forgot. Perhaps I put it in a file where it didn’t belong. In a couple of hours, I passed through stages of anger, dismay and acceptance. What’s gone is gone. Luckily, I didn’t have to start from scratch; it was a revision of a chapter in my first draft, which remained saved. Somehow, though, I cannot let go of the idea that the first revision was better. I know I’ll have to dig deep and work on this piece again and again, and still I may not be satisfied. The joy of working on it this morning – of tweaking the plot, discovering new possibilities, ratcheting up the tension – disappeared with the file itself. I know there are some obvious lessons here. I need to back up my files, again. I should print out my chapters more often. Maybe pushing myself to write all day is foolhardy, when I know that I’m at my best in the morning. Asked for advice, my son was less than sympathetic: “I don’t need to recover my files because I don’t save over them.” Yeah, thanks. When it became clear Chapter 21 had vanished, I did what every writer should do when faced with such a calamity. I took my sarcastic son to lunch. Then I sat down and got back to work. It’s been a whirlwind couple of weeks. Three days in Williamstown, Mass., with my husband, where we saw a Van Gogh exhibit at the Clark Art Institute, attended a new production of Eugene O’Neill’s A Moon for the Misbegotten at the Williamstown Theatre Festival, and visited the Robert Frost Stone House Museum in Shaftsbury, Vt. Then, home to clean house, attend a reunion on Sunday of former newspaper folks, and enjoy a lovely three-day visit with a dear college friend. Patti and I talked nonstop, visited Doris Duke’s Rough Point estate in Newport and strolled the laid-back resort of Watch Hill. Yet through it all, I wrote . A book review, 1,600 words of the novel and a review of the O’Neill play, all while staying in Williamstown. Another two days of novel writing on Monday and Tuesday, before and during Patti’s visit. Back in the saddle today after her departure, writing and rewriting for two hours. Make no mistake: I am no Stephen King, who writes 365 days a year, even on Christmas, the Fourth of July, and his birthday. I admire that sort of dedication, but I also know there are days I’m not going to make it to the writing desk. But this is August, and as all writers know who make their living teaching, time is running out. In her novel of the same name, Judith Rossner noted that the month strikes terror in the hearts of psychiatric patients, because their therapists vacate New York City for the Hamptons, leaving them to their own devices. For college professors, August is ominous for a different reason: it’s the last buffer between summer break and the grind of syllabi preparation, teaching, and correcting. We know if we want to get that short story, memoir or novel draft done, we have to double down now – or else give up until January. August has a silver lining. When time is limitless, writing lags. An approaching deadline tends to focus the mind. A patient with a vacationing therapist learns to cope. A writer with a deadline gets busy. 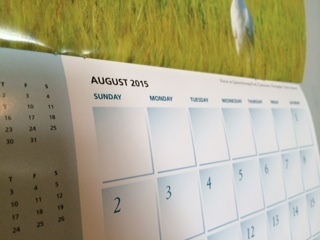 Let us celebrate August, all 31 days; because it is finite, because it is vacation, because it makes us work.